Do Something! After the March. Now What? It’s been all over the media. Women’s marches this weekend drew an estimated 3 million people to protest the inauguration of Trump. Marchers marched across the country to stand up and speak up for the rights of women, as well as other communities targeted by the GOP and the Trump agenda. These communities include (but are not limited to): women, Blacks, LGBTQ people, indigenous and native people, disabled people, muslims, low-income people, sick people… basically everyone but the Donald and his friends. In response to attacks on civil rights, and the rising tide of hate speech in our schools and communities, people are mobilizing to push back. More and more folks are waking up. More and more of us are realizing we can’t ignore racist narratives and hope they’ll blow over. As the Black Lives Matter movement has been saying FOR YEARS… silence does not only equal consent, Silence = Death. 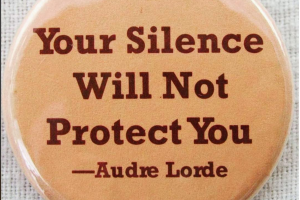 Now more than ever, it is important for all of us to stand up and speak up for targeted communities, especially when and where we have privilege. I love this art by Micah Bazant. If you click this link you can download a free poster and also link to K-12 curriculum. Nonetheless, just like the whole safety-pin thing, I’m having trouble wrapping my head around the ways many “allies” perform engagement, but don’t actually show up when their support is needed. Putting up posters, or wearing safety-pins or pink p*ssy hats will not protect folks from the very real dangers many communities are currently facing. We need to do MORE than just perform our support—we need to take ACTION. This is one of the cool posters I wanted to share. Click the picture to download a free Pdf poster. If you do… please, don’t just post it. 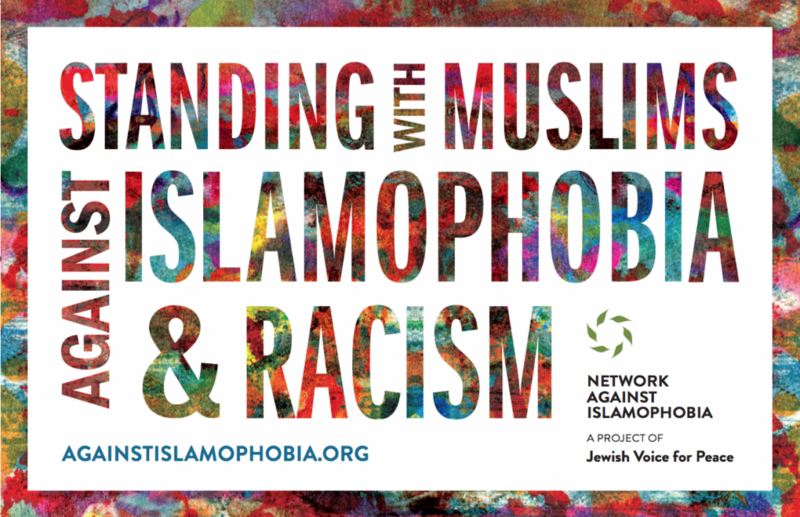 Think of ways to use this poster to start larger conversation about what you can do to support Arab and Muslim families. I love the idea of having posters like this line the hallways of my daughters school and every school in the nation. I think they should be there. But if inclusive posters like these are up on classroom walls, and adults schools don’t actively address racist “jokes” about Muslims being terrorists, or transgender youth are scared to go to the bathroom, or Black children are being criminalized for being “defiant”… I think posting posters like these actually does a disservice. Let’s get real for a moment, shall we? Black and Brown folks are experiencing a LOT of cognitive dissonance right now. Many of marginalized folks are finally hearing people say the right things and seeing hopeful signs of engagement. Nonetheless, we are also seeing a disconnect between the words and actions of our supposed allies. This same school recently held elections for student representatives, online, outside of school time, with a closed nominations process. The winning student got a total of 20 votes, out of a school of 600 students. When student and parents spoke up about it at a community meeting saying it disenfranchised low-income students. Nothing happened. My daughter was interviewed at a recent march protesting the Trump Inauguration. In the interview she said, “We just can’t sit around and do nothing.” Kids (and especially teens) are fine tuned to look for the disconnect between words and actions. She tells me every day, she wishes her school would do more to speak up and stand up for the values posted on the wall. Don’t get me wrong… I’m glad these issues are now visible and folks are talking about racism, misogyny, transphobia, islamophobia, ablism… GREAT! As you know, I’m a big advocate for talking about equity. It’s a good start. But if that’s ALL your doing… just talking… it’s not gonna cut it. And if the only people you will allow to speak are privileged people, that’s not going to cut it. And if conversations need to be “safe” for White, cis-gendered, English-speaking, (you get the picture) people, that’s not going to cut it either. If YOU are a member of a privileged group, if you are talking but AREN’T DOING anything to change systems oppression, YOU are a part of the problem. And just so you know… the YOU I’m referring to, also includes ME. We are ALL a part of privileged groups. And as members of privileged groups we ALL have to get engaged and get our hands dirty, and roll up our sleeves and at the very least get uncomfortable and get to WORK! So where do we go from here? I’ll leave you with a poster that I think says it all. So what do you think? How are you going beyond SHOWING support to TAKING ACTION? 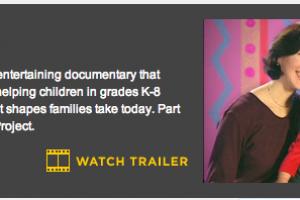 What resources or ideas can you share with other parents and educators? 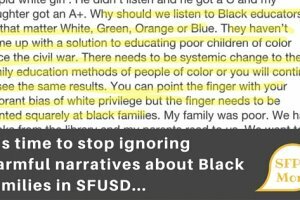 Did you know there is a parent organization spreading racist narratives about Black and Latino families in our district?